To edit a location click on the name and it will reappear in the fields to edit. ** Note, you want to enter the start/end date as the date for the first day the event begins. The end date of the reoccurring event is entered under the "advanced settings tab"
You can set up this feature on each team page calendar and then set the “Club Calendar “ as a sub-calendar. Anything you update on the team page calendar will only display here, but anything you add to the “club calendar” will automatically display on the team page calendar. In order to distinguish each grade/team page calendars, you will want to edit the calendar module title. 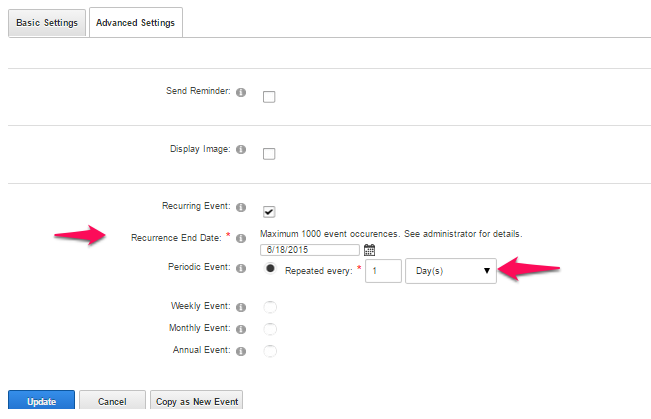 Hover over and from the drop-down menu choose "Edit Settings"
Once you have chosen all calendars click update settings.